Digital microfluidics: is a true lab-on-a-chip possible? 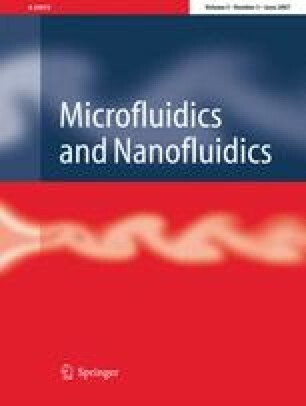 The suitability of electrowetting-on-dielectric (EWD) microfluidics for true lab-on-a-chip applications is discussed. The wide diversity in biomedical applications can be parsed into manageable components and assembled into architecture that requires the advantages of being programmable, reconfigurable, and reusable. This capability opens the possibility of handling all of the protocols that a given laboratory application or a class of applications would require. And, it provides a path toward realizing the true lab-on-a-chip. However, this capability can only be realized with a complete set of elemental fluidic components that support all of the required fluidic operations. Architectural choices are described along with the realization of various biomedical fluidic functions implemented in on-chip electrowetting operations. The current status of this EWD toolkit is discussed. However, the question remains: which applications can be performed on a digital microfluidic platform? And, are there other advantages offered by electrowetting technology, such as the programming of different fluidic functions on a common platform (reconfigurability)? To understand the opportunities and limitations of EWD microfluidics, this paper looks at the development of lab-on-chip applications in a hierarchical approach. Diverse applications in biotechnology, for example, will serve as the basis for the requirements for electrowetting devices. These applications drive a set of biomedical fluidic functions required to perform an application, such as cell lysing, molecular separation, or analysis. In turn, each fluidic function encompasses a set of elemental operations, such as transport, mixing, or dispensing. These elemental operations are performed on an elemental set of components, such as electrode arrays, separation columns, or reservoirs. Examples of the incorporation of these principles in complex biomedical applications are described. The author acknowledges funding from the following sources that has enabled technology development and collaborative efforts across many disciplines: DARPA, NSF, NIH, Lord Foundation, Glaxo Smith Kline, and the Duke University Medical Center. In addition, substantial contributions are acknowledged by current and former students at Duke University whose contributions have helped establish significant progess in the application of EWD towards a useful end.